Starbucks really hasn't figured out what it's selling. Starbucks real product is a sense of community. What does Starbucks really sell? That’s a question Starbucks has been trying to answer for a while now. Their coffee drinks are great, but lots of places are serving great coffee drinks now including McDonald’s and Burger King. This must be putting real pressure on Starbucks as many stores have closed in the past few years and my favorite location just applied for a liquor license. Liquor license? Really? What about all those kids meeting to study or just hang out? The addition of liquor changes the whole Starbucks dynamic. Patios may have to be “fenced.” Patrons will have to be carded. Minors will have to be watched. What really hurts Starbucks is deeply rooted in their DNA. They started out as bean merchandiser and to this day they still see themselves as a retail store selling everything from CDs to mugs to coffee makers too, of course, beans. Everything seems to be made to be sold and taken home or elsewhere. Did you even know you can get a real china cup filled with your favorite brew at most Starbucks instead of a paper cup? The real product at Starbucks is a community, but they either don’t seem to get it or don’t know what to do about it. As a former bar owner, it seems obvious to me. 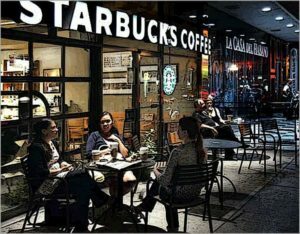 Starbucks replaces society’s need for a gathering place. Since the fall of the liquor/bar business, Starbucks has become the defacto replacement for social gathering. Ironically, Starbucks doesn’t seem to know what to do about this. They try everything but making people feel welcome to just sit and visit. My wife and I literally get “thrown” out several times a month for playing chess past the designating weekly closing time often PM. So, as a former bar owner, here’s my suggestions to Starbucks. Do this and you will flourish. Ignore this and you will continue to falter. Forget about liquor. You have no idea the avalanche of negative social issues and expense you will bring on. You’re a family place that caters to everyone able to reach the counter. Celebrate it. Get rid of the merchandise. Everything you sell can be purchased cheaper online or at Target or Sears. Merchandise doesn’t set you apart. OK keep a few logo mugs but get rid of everything else. Get some fresh pastry. That dry stuff you charge premium prices for is embarrassingly bad. Better yet, make pound cake and cookies yourself on premise. Imagine how the smell will complement the already great smell of the coffee. Invest in your café seating. Build cute outdoor seating areas outside of every location and put more tables/furniture inside (where the merchandise used to be). While you’re at it, build a bar in front of the baristas for single people to sit and talk to him. Offer table service. Have servers on hand to wait on tables and teach them to be social directors. They should learn regular’s names and introduce people to each other. Put an acoustic guitar player or piano player in the corner every Thursday through Saturday night with absolutely no amplification – none. Forget about selling music. Leave that to iTunes. Instead, allow your servers to mix playlists or play local radio or CNN. Above all, realize that your not a retailer anymore, you’re a social center. Invite people to come in, visit as long as they want and facilitate real social networking via your servers and barista.